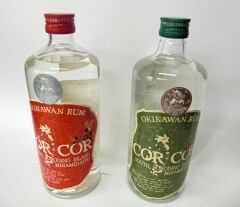 Okinawan rum "CORCOR AGRICOLE," on the right, and "CORCOR" shipped to France for the first time. On May 23, Yuko Kinjo, president of the Grace Rum Co., based at Minami Daito Village, shipped about 1000 bottles of rum to France for use in hotels and restaurants. The company produces its rum from local sugar cane and sells it as a local product of the island. This is the first time for the company to make a proper shipment overseas beyond small quantities previously shipped for exhibitions. Two varieties were shipped, one using the juice of sugar cane grown in Minami Daito Island called “CORCOR AGRICOLE” and the other called “CORCOR” made mainly using molasses produced when making sugar. Grace Rum was founded in 2004. The Minami Daito factory is capable of producing 8000 bottles of rum a month. This shipment had been dispatched from the island for France before the Great East Japan Earthquake occurred, but most export cargo from Japan was held up because trucks were not operating because of gasoline shortages and rolling power-cuts in Tokyo, and they were also required by their business partner in France to submit a document to certify the safety of rum after the nuclear power plant disaster. The shipment of rum finally got through to the customer on May 12.